How Do Guinea Pigs Clean Themselves? 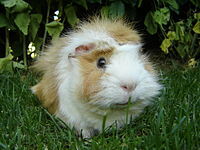 If you have had guinea pigs for any length of time you may notice that they don’t require that much maintenance in terms of cleaning. This is especially the case if you have a short haired cavy. Long haired guinea pigs require a bit more time on the maintenance side of things. So how do guinea pigs keep themselves clean? Like cats, they are very good at spotting when dirt or grime appears on their fur and as soon as this happens they need to do something about it. They are proud of their coats and strive to keep them as clean as possible. So what they do is lick and nibble the spot of fur which is dirty and do so until the dirt or grime has gone. This is a natural instinct and one which they learn to do as soon as they are old enough. When they are young their mother will do this for them until they learn how to do it. But what about their faces? If you observe them, you will notice that they clean their faces by licking their paws and then wiping their faces. Some even say that they use a milky white substance in their eyes in order to do this, but I’m not certain of this. So in order to do this, they must be very sensitive to when there is something out of place on their face in order to do this. So what happens when they get really dirty? When they get really dirty they may need assistance in bathing, and the trick is to run a small bath for them with about an inch of water and then bathe them in it for a short time in order to get the dirt and grime off them. They won’t like it very much though, so don’t do it for long. However, if you don’t do this, then they will eventually get rid of all the dirt and grime themselves.